During high school, students are often overwhelmed, stressed, and unorganized. This can cause many negative consequences such as worsening grades, lack of sleep, and missing assignments. Improper time management may be the culprit. 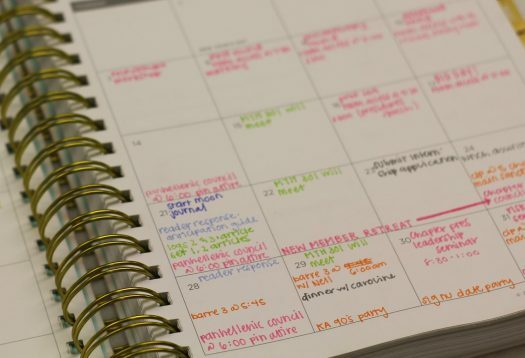 Students who plan out an agenda and stick to it tend to be more successful. Agendas are extremely helpful as you can write down a list of things to do instead of keeping it all in your head. Having a list in your head can get chaotic and often important tasks get forgotten. Clear your mind by visually seeing what you must complete in a day. In your agenda, write down a plan to complete all assignments, prioritize most important tasks first, and note how much time each item may take. This will create goals and increase your focus and dedication. If you have a long term assignment, make closer deadlines and complete some of it every day. This will eliminate procrastination, which is a major issue students deal with daily. Also, if you begin to feel stress building up, take a mental break between each assignment- sloppy minds equals sloppy work. Take time to recuperate, and then get back to the task at hand. Delegating your agenda is helpful as well. If you are still finding it difficult to maintain your agenda, cleanup a quiet and peaceful area where you know you can concentrate. Get rid of any distractions, such as cell phones. If the cell phone is necessary for work, then put it on Do Not Disturb, to ensure a peaceful, uninterrupted study session. Time management and stress management often go hand in hand, and while other things cause stress on top of that, you’d be surprised what simply prioritizing can do. Stress is normal for every student. Every human experiences stress now and again, but effectively managing this stress can drastically increase your happiness and success as a student. First, and as tacky as it may be, breathe. Just getting more oxygen to your brain can instantly clear your thoughts, and allow you to make more rational decisions. Taking a break, while it may seem under productive, is sometimes the most productive thing a person can do. Whether it’s stopping for a small snack, taking a short power nap, or even plugging in headphones and listening to music. Breaks can be crucial to the rest your overloaded brain needs. Not getting the proper amount of sleep at night or not exercising enough can also increase stress levels. Meditation is a common stress reliever, and can also help with panic attacks. Time management can affect your stress level, so being productive, organized, and maintaining a clear mind can create a better lifestyle.